I was recently invited to an Organic Chocolate making and decorating workshop by MyChocolate, an organisation with a very lovely vintage themed kitchen located just off the famous Leather Lane market near Chancery Lane tube station, in Central London. MyChocolate have been working on spreading love for the sweet and wonderful brown stuff for the last 8 years. Their workshops are aimed at individuals, groups (friends/hen parties/work team building) and can be tailored to your experience and interest. We started off with an ice breaking and fun activity of mixing Chocolate Martini cocktails. I will confess, this is much harder in practice than it sounds on paper; it is one of those skills like rubbing your tummy whilst patting your head that takes a bit of practice to perfect. However, it didn't matter as we had the chance to consume and therefore eliminate the evidence! We then were guided through the fascinating history of chocolate. Our Chocolatier, Jordan, was full of knowledge and happy to answer our questions. Jordan, our Chocolatier, in action! Jordan also talked us through the process of making chocolate from the harvest of the bean to the making of the bar. We had the opportunity to sample cocoa nibs (crunchy, tasty, but unlike chocolate itself) and 100% pure chocolate (really quite bitter, unlike 75% or 80% cocoa solid chocolate). We then had the opportunity to make a personalised giant organic chocolate button. We were provided with lots of wonderful toppings and the use professional chocolate dipping forks to create a marble effect. Again, another thing which sounds easy, but proves to be more difficult when attempted! We then learnt how to make chocolate truffles by making our own chocolate ganache (using molten dark chocolate and cream), using a piping bag to form the truffles, allowing to cool and then dusting with cocoa powder. Finally, we exercised our full creativity by making our own organic chocolates, making truffles, chocolate coated truffles and decorating them using white and pink chocolate flakes, caramelised hazelnuts, transfers, and breadcrumbs. 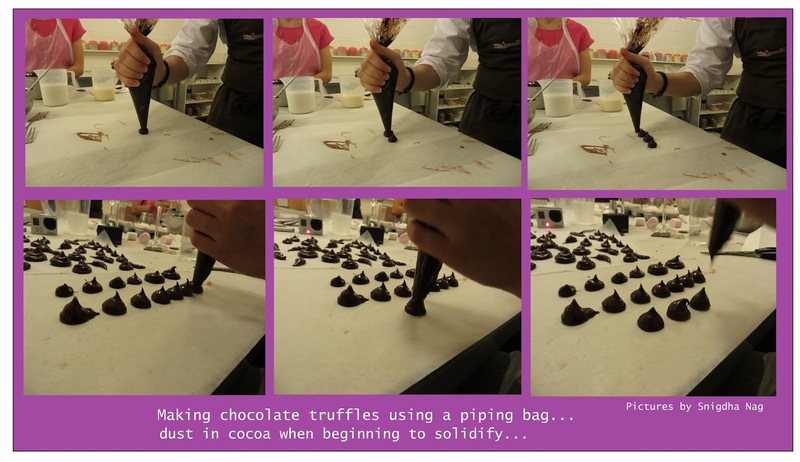 After waiting for them to dry, we were able to package our handmade chocolates in ribbon tied bags. I found the workshop enjoyable. The Martinis are delicious, learning how to make and work with the chocolate is fun, and the people at MyChocolate turn a blind eye if you dunk a marshmallow in the molten chocolate, as long as you use a chocolate fork and not your fingers! The staff at MyChocolate are really warm, friendly and welcoming. They are more than willing to help you with anything you might be finding unfamiliar or challenging. My only warning is that the chocolate starts to solidify much faster than you would think. So you have to move forward quickly and with confidence. If drizzling or dipping, you need to move them to prevent the bases becoming thick. If you don't follow this advice, your final results will look unattractive and lumpy. I was particularly impressed that the class was able to cater for people who had dietary requirements. One of our attendees had lactose intolerance, and as a result, a special molten chocolate made with coconut milk was prepared especially! If you have a nut allergy, I would advise you to contact the people at MyChocolate, details below. 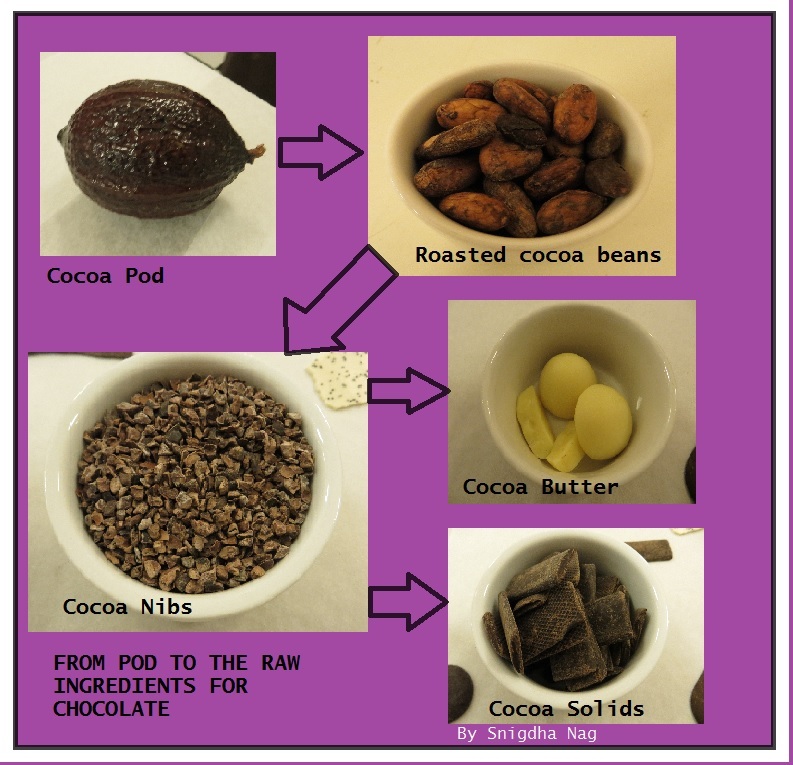 Snigdha attended the MyChocolate workshop as their guest.